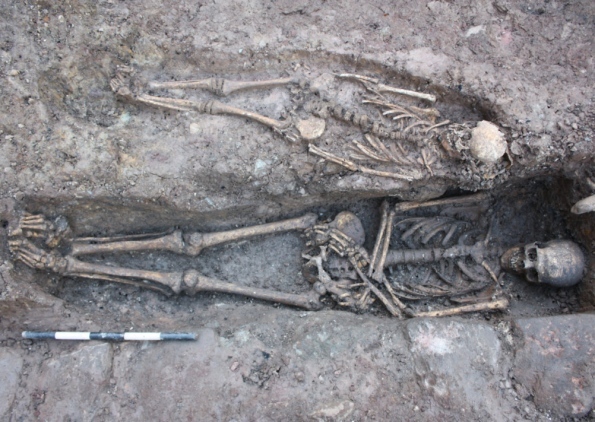 ROYAUME UNI – Edinburgh - A City car park has been hailed a “real treasure trove of archaeology” after seven more skeletons were unearthed from the grave of a medieval knight. Archaeologists working on the site now believe they have uncovered the remains of a family crypt having found bones from three fully grown adults, four infants and a skull. The exciting discovery comes one month after experts excavated the burial site of a medieval knight - affectionately christened Sir Eck - within the grounds of the new Edinburgh Centre for Carbon Innovation (ECCI) at High School Yards, off Infirmary Street. Carvings of the Calvary Cross on an elaborate sandstone tomb and an ornate sword found beside the remains led archaeologists to believe it was the burial plot of a high-status individual such as a knight or nobleman. These new finds look likely to be the possible relations of the suspected medieval knight we found earlier this year. The skull of the skeleton found immediately beneath the location of the knight looks like that of a female and the remains found on the other side of the ornate slab belong to an infant from the same period. The fruitful dig centres on the site of three historic former buildings: Old High School founded in the 1700s, the 16th-century Royal High School and Blackfriars Monastery, established in 1230 by Alexander II and destroyed during the Reformation. ROYAUME UNI – Portland - An important new archaeological dig is being planned for a site on Portland this summer. The site, off Reap Lane, Southwell, has already been checked with geophysical equipment and results suggest that there are areas where archaeological remains could be found. Excavations nearby a few years ago uncovered stone tools thought to be from the Late Neolithic or Early Bronze Age. The dig will be carried out by the Association for Portland Archaeology guided by founder Susann Palmer and co-director Martin Blundell. Now Susann is preparing to help guide this summer’s dig and she said: The site is towards the bottom of Barrow Hill below Southwell Business Park. “ It is quite exciting; there’s a good chance of finding something because it is unrestricted and near a natural spring which would have been attractive to people about 4,000-4,500 years ago. SYRIE – Alep - The 11th-century minaret of a famed mosque that towered over Aleppo's old quarter was destroyed yesterday as fighting raged in the ancient Syrian city. 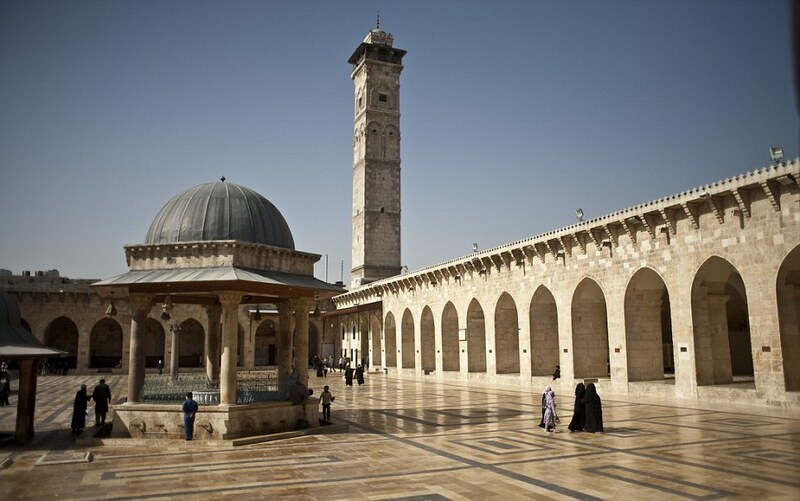 President Bashar Assad's government and the rebels trying to overthrow him accused each other of being to blame for the destruction to the Umayyad Mosque, a UNESCO world heritage site and centerpiece of Aleppo's walled Old City. 'This is like blowing up the Taj Mahal or destroying the Acropolis in Athens. This mosque is a living sanctuary,' said Helga Seeden, a professor of archaeology at the American University of Beirut. 'This is a disaster. In terms of heritage, this is the worst I've seen in Syria. I'm horrified.' The destruction in Aleppo follows the collapse a week earlier of the minaret of the historic Omari Mosque in the southern city of Daraa. The Daraa mosque was built during the Islamic conquest of Syria in the days of Caliph Omar ibn al-Khattab in the seventh century. BANGLADESH – Bewla - Archaeologists have unearthed relics of an about 1100-year-old brick structure at remote Bewla village in Ghoraghat upazila under the district. 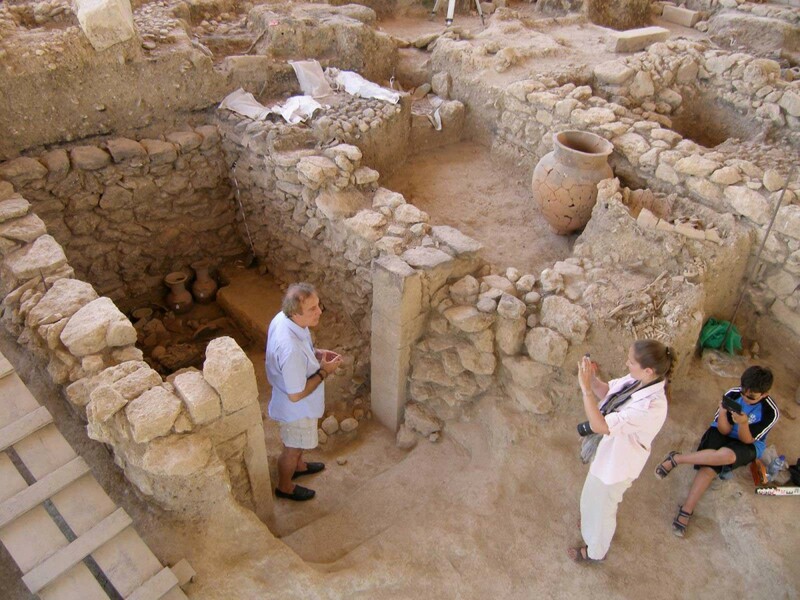 “We assume the ancient structure might be built during the Pala era, between eighth and ninth centuries. More excavations will be needed to ascertain whether the structure belonged to the Buddhists or the Hindus,” Swadhin Sen, associate professor of archaeology department of Jahangirnagar University, also chief of the excavation team, said on Sunday. The 40-member team started excavating the site on March 27 and found the structure on a 52 X 32 metre platform on a khas land near Gopalpur Eidgah field at Belwa village on Saturday. Earlier the land was leased to a local for farming. Around eighty years ago, two copper plates inscribed with the names of Mohi Pala and Bigraha Pala were found at Bewla village, which indicates the ancient brick structure might be of Pal era. The copper inscriptions are now in Kolkata Museum. In 2011, a survey carried out by a team led by Syed Quamrul Ahsan of archaeology department of Jahangirnagar University found 51 archaeological sites in Ghoraghat. Archaeologist AKM Jakaria in his book ‘Bangladesher Pratnatatwa Sampad’ describes Ghoraghat as a historically important area, said Swadhin. Earlier, a Pala era structure was found in Birampur upazila of Dinajpur. INDE – Vannathiparai - On Thursday, thousands from Tamil Nadu will offer worship at a temple dedicated to Kannagi situated at Vannathiparai in Kerala abutting Theni district. 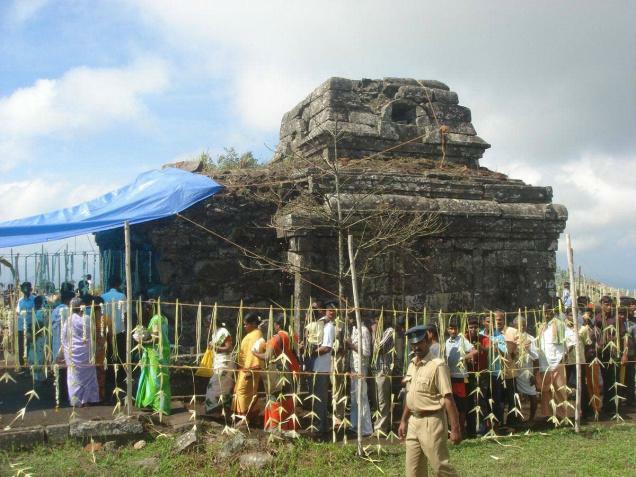 The temple, popularly known as Mangaladevi Kannagi Kottam, has remained a symbol of monumental neglect. This annual ritual on Chitra Pournami is the only occasion when Kannagi, the ordinary woman who burnt Madurai for the injustice meted out to her by King Pandian Nedunchezhian, is worshipped. Kannagi, according to literary evidence, walked for 14 days from Madurai to Vengaikanal Nedunkundram, where the temple is now located. From here, she is believed to have reunited with her husband Kovalan. Tribal people, who were witness to the event, reported it to the Chera king, Chenkuttuvan, during his visit to the hilly region. As per legend, the king brought stones from the Himalayas to construct the temple for Kannagi. The King of Ceylon, Kayavagu, attended the consecration of the temple. Though it originally belonged to Tamil Nadu, as per the earliest evidence of 1817 (a survey was conducted by the East India Company) and St. George Gazette of November 15, 1883, it now falls in Kerala territory. It is easily accessible from the Kerala side. The two inscriptions found at the temple relate to Rajaraja Chola of 11th century and Kulasekara Pandian of 13th century. According to a senior epigraphist, the 11th century inscription is ‘fragmentary’ and refers only to Rajaraja Cholan. The later inscription has a reference to the Amman in the temple as ‘Pooranagiri Aludaya Nachiar’. A related reference to the Mangaladevi temple is found in a Perumal temple at Gudalur in Theni district. This is juxtaposed with a reference to Kannagi as ‘Mangala Madanthai’ in the Tamil epic, Silappathikaram, and the deity in the Mangaladevi temple is worshipped as the epic’s heroine, he explains. Silappathikaram narrates the story of Kovalan, a merchant of Poompuhar, who loses heavily in his business because of his obsession with Madhavi, a danseuse. He moves to Madurai with his wife, hoping to revive his business to regain the lost fortune. When he goes to sell his wife’s anklet, the goldsmith takes it to the king and makes him believe that it is the queen’s lost anklet. The king immediately orders the beheading of Kovalan without even seeing him. Enraged at the injustice, Kannagi visits the king’s court to prove her husband’s innocence. Her anklet has emerald, while the queen’s anklet was made with pearls. The king, ashamed at his misjudgement, dies on the throne, followed by his wife. But Kannagi, the first ordinary woman to become the protagonist of a Tamil epic, is unable to come to terms with her personal tragedy and sets Madurai on fire. She walks for 14 days to enter the Chera country and reaches the spot near Kumuli in Kerala to reunite with her husband. Mariamman worship became popular in the State after Kannagi. Devotees visiting the temple on the occasion of Chitra Pournami, between 6 a.m. and 5 p.m., are pained at the neglect of Kannagi Kottam. There is progressive decay of the two structures at the temple. CHINE – Zibo - A 2,000-year-old bronze mirror workshop has been excavated in east China's Shandong Province in the first such discovery in the country, Xinhua news agency reported. 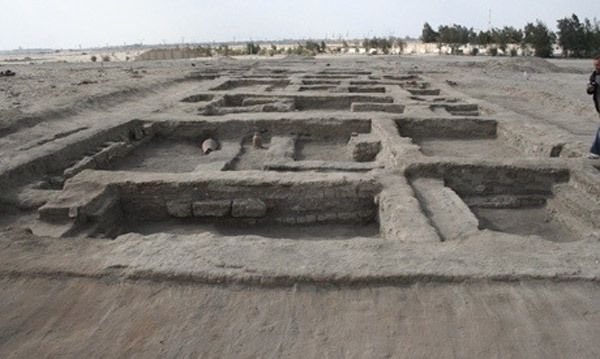 Bai Yunxiang, deputy director of the archeological institute of Chinese Academy of Social Sciences, said that more than 100 stone moulds along with foundry pits, wells and blastpipes were unearthed at a site in a village near Zibo City. The workshop is believed to have been active in the early period of the Han Dynasty (202 BC - 220 AD), when the once-costly bronze mirrors gradually became household objects. "It is the first time that a bronze mirror workshop has been discovered, providing precious insights into technologies used for China's ancient mirror making," Bai said. Bai said the artifacts are representative of mirror designs during the Han dynasty, including a mould with patterns incorporating "panchi," a dragon-shaped monster commonly used in mirror decoration and another with a grass-leaf design that became popular at the start of the era. It is believed that the workshop formed part of the industrial zone of the ancient city of Linzi, which flourished as a commercial hub during the Eastern Zhou Dynasty (770 BC - 221 BC). A dozen other coin and ironware workshops have also been discovered in the area. GRECE – Eleutherna - Ancient Eleutherna is one of the capital cities of ancient Crete with a history of about 5000 years (3000 BC-1300 AD). Situated on the NW ridges of the highest Cretan mountain, Mount Ida, the city stands out like a huge stoned ship that anchored amid the breathtaking silvery-green of the olive-trees, oaks and vineyards. Thousands of people have lived on this hill in the course of history but the most important period was the Early Iron Age (1000-600 BC), i.e. the period of the Homeric epics (Iliad and Odyssey). The verses of this great poet, Homer, are illustrated by the history and especially the funerary customs unearthed in Eleutherna’s most important necropolis at Orthi Petra (i.e. Standing Stone). Thousands of artifacts - made of gold, silver, bronze, iron, clay, glass, faience etc.- of unique artistic and historical importance will be the focus of this lecture, vividly proving the interconnections between Eleutherna and the other Cretan cities as well as with the Aegean, the Dodecanese, Asia Minor, Cyprus, Phoenicia, Syria and the Near East, Egypt and the central Mediterranean (including possibly Sicily and Etruria). ROYAUME UNI – Leicester - When archaeologists discovered the remains of Richard III last summer, they also stumbled across a second exciting find. A 600-year-old, lead-lined stone coffin was discovered buried near the Plantagenet king's humble resting place in the city council car park in New Street, in the city centre. Now, the same archaeologists are planning a second dig this summer to uncover the much older tomb which, they believe, could belong to a former Leicestershire knight named Sir William Moton. In July, a team lead by Richard Buckley, the director of the university's archaeological services, will re-excavate the city council car park in a bid to exhume the remains. Mr Buckley said: "It's an exciting discovery – the coffin looks like it's a bit earlier than Richard III. It is potentially 14th century, and there's one person we have reference to called Moton, a knight who was buried there." Sir William was a knight who was believed to have been born in Peckleton, where he also lived. There are records of a William Moton being married to two women – the first is named as Joan, and the second Elisabeth. He had a son called Robert with his first wife. According to historical accounts, Sir William was buried at the church of the Greyfriars in 1362, 123 years before Richard III. The tomb is one of four graves discovered during the first Greyfriars dig. The university team will examine in more detail the church of the friary, where the knight's tomb and Richard III's grave were found.